Cabot Circus in Bristol is a uniquely-designed, modern shopping centre based in the heart of Bristol Shopping Quarter. It’s hard not to be wowed by the sheer size and design of the circus; the shell-shaped glass roof keeps you dry but the fresh air circulates to give a really pleasant indoor-outdoor shopping experience. Here you will find all your high-street favourites such as Zara, Next, Monki and Victoria’s Secret. There are so many shops to choose from we couldn’t possibly list them all but check out the Cabot Circus website for full listings. Your Cabot Circus shopping experience continues across Penn Street into Quakers Friars, named after the friar that still stands in the midst of high-end, designer shops and eateries, including Apple, All Saints, COS, Oliver Bonas and many more. The piazza is surrounded by restaurants and cafes and in the warm months you can dine alfresco as water fountains dance playfully in front of you. 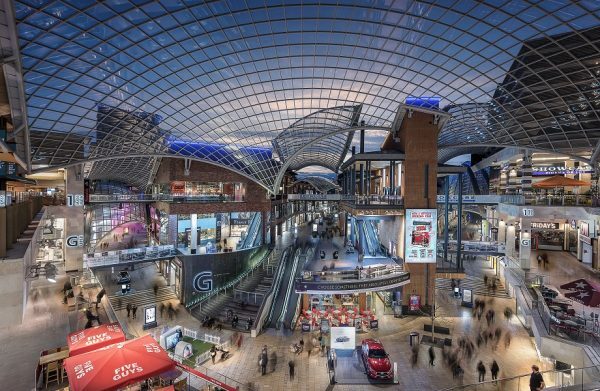 Cabot Circus makes a shopping day out fun for all the family; try your hand at crazy golf adventure, have a go at amazing VR games in ImmotionVR or watch the latest film in the 13-screen Showcase Cinema De Lux. Finish off the day with dinner at one of the newly opened restaurants, Casa Brasil or The Real Greek. For more information visit the Cabot Circus website.